The patient was being treated at Royal Alexandra Hospital in Paisley for an 'underlying condition'. 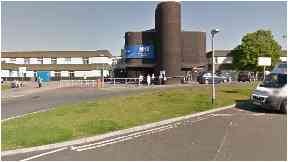 A patient has died after a bacterial outbreak at a hospital in Paisley. The death happened at Royal Alexandra Hospital, where the patient had already been struggling with an "underlying condition". NHS Greater Glasgow and Clyde (NHS GGC) would not confirm when the death occurred. Two other patients also contracted the infection. It is the latest in a number of patient deaths related to an infection which have come to light this year. An NHS GGC spokeswoman said: "Our thoughts are with the family of the patient who has passed away. "We closely monitor infection rates within our hospitals at all times. "Patients in the unit have been screened and tests have proved negative. There have been no further cases. "Sadly a patient, who was seriously unwell from their underlying condition, has died and a bacterial infection was one of a number of contributory factors. "A second patient has been treated and is recovering and a third patient has not required treatment and is stable from an unrelated condition." Health secretary Jeane Freeman said: "My thoughts and sympathies are with the families involved, and in particular the family of the person who has died. "NHS GGC are giving support to the family and have communicated the situation to all the other patients and families involved." Meanwhile, prosecutors continue to look at two deaths at Glasgow's Queen Elizabeth University Hospital. A ten-year-old boy and a 73-year-old woman died after contracting the Cryptococcus infection.